Native to East Asia the Chinese Elm is one of the most popular bonsai trees, especially among beginners. These lovely semi-evergreen trees can grow up to 65 feet tall in their native habitat, but have been cultivated in miniature form for Bonsai for generations. It is an ideal choice for those just starting out because it is slow-growing and tolerant, the Chinese Elm allows beginners plenty of time and forgiveness to grow accustomed to bonsai care making it one of the most loved and most undemanding of miniature trees. The Chinese Elm has beautiful, distinctive dark gray to reddish brown bark that turns fissure and corky when mature. It has a lovely branching shape with delicate, oval shaped toothed leaves that showcase a fresh green color and a delightfully tiny leaf. It has a highly predictable growth pattern, making it ideal for beginners who are just getting used to training Bonsai. Though generally tolerant, the Chinese Elm does not like drafts or a lot of variation in temperature. Most indoor tropical bonsai trees prefer temperatures between 60 and 70 degrees Fahrenheit. In the summer, Chinese Elm trees can be kept outdoors. However, you must remember to bring your bonsai tree indoors when the temperature drops below 60 degrees. Like most bonsai, Chinese Elms need a lot of light. Direct morning sunlight is great for almost all bonsai because of its low intensity, so choose a room that gets the most light during the day. Keep in mind that, during warm months, the direct afternoon sun through a standard household window can burn delicate leaves. Chinese Elms prefer their soil to be slightly moist and allowed to dry out a little between watering sessions making it a practical choice for the frequent traveler. To get familiar with when to water the Chinese Elm Bonsai, stick your finger a half-inch it on the soil: If you do not feel much moisture, then it is likely time to water. Never let the soil become completely dry for long. During the winter months your Chinese Elm will require less water. In the spring and summer, it may need water every day or so, depending on location and climate. Watering cycles will vary, so avoid strict schedules. Get to know when your tree needs watering by observing its foliage, testing the soil with your index finger, or by weighing the pot in your hands. The drier the tree, the lighter it will feel. If you have a water mister, try misting your tree a couple times a week to help with humidity. Misting is beneficial to your tree’s health but it is not a replacement for watering. Make sure you elevate your pot on pebbles so that its roots do not sit in water, this will provide your plant with moisture, without contributing to root rot. Our Haws Watering Set, which consists of a watering can & professional mister, will help you deliver the perfect amount of water to your Chinese Elm. 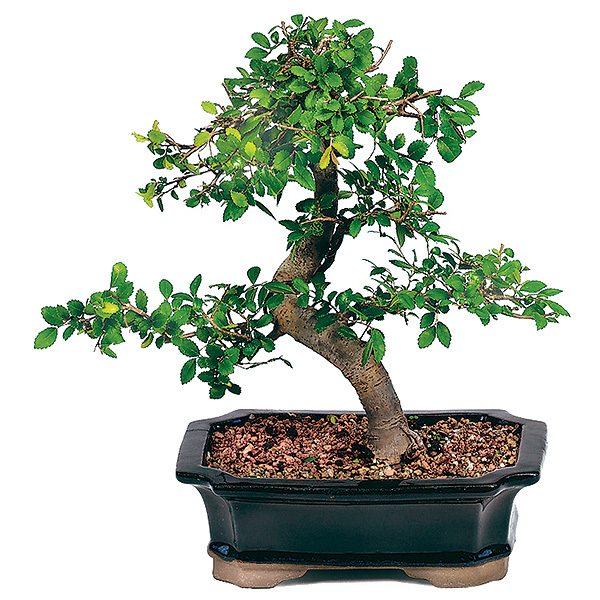 Fertilize your Chinese Elm bonsai once every two weeks during the growing season (spring through fall) with a bonsai-specific or organic fertilizer. Water your tree well before fertilizing and try our Neptune's Seaweed (0-0-1) - an organic supplement which provides over 60 naturally occurring major and minor nutrients and amino acids. Pruning is necessary to maintain the right shape of your bonsai and also to encourage new growth. That means removing small branches, buds, and new shoots.. Chinese Elm trees are ideal for beginners because their branches can be pruned all year and doing well when new shoots are allowed to develop eight leaf pairs, and then trimmed back to two or three. Check out our TinyRoots 4 Piece Tool Set which comes with a 101 Tips book. Wiring your Chinese Elm can be done to branches at all times throughout the year, but only do the shoots once they have become slightly woody. The Chinese elm is beautifully suited to the classical umbrella shape but can be shaped in most other styles with proper pruning alone. Bonsai are susceptible to the same pests and diseases as common house plants. The best defense is to keep your tree clean and healthy. Keeping the leaves free from dust will allow proper circulation in your tree. If you notice any abnormal leaf drop, stickiness to the foliage, or visible insects, you need to treat the problem promptly. Start by spraying your bonsai with a solution of 1 tsp dish soap to 1 quart tepid water or Neem oil spray and spray till mixture runs off the leaves; Rinse solution off leaves with plain water and repeat every few days as needed. The fastest way to propagate the Chinese Elm is with 6 inch cuttings taken with sharp, clean scissors in the summer. Place in a glass of water and roots will soon develop. Repot rooted cutting in a quality bonsai soil or a mixture of 2 parts loam, 1 part peat moss, and 1 part sand. Chinese Elms will need to be repotted approximately every two years in the early spring. Sometimes Chinese Elms do not react well to extreme root pruning, so avoid pruning the roots too far back when repotting. After repotting, water thoroughly and keep the plant in a shady location for several weeks in order to help the new roots grow. When you are ready to re-pot be sure to check out our amazing selection of beautiful bonsai pots. This tree will tolerate all kinds of mistakes, such as over watering, under watering, or temperature changes. As one more point of interest, Bonsai, like people and animals, are sensitive to the effects of second hand smoke and will be healthier in a smoke free environment, just as you will enjoy cleaner air as your bonsai radiates its life giving oxygen to your home.